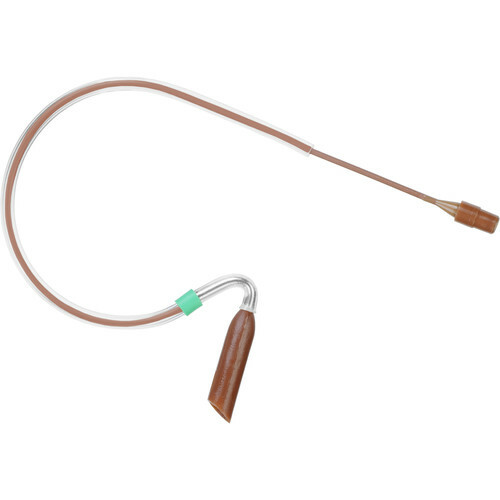 The cocoa E2 Unidirectional Earset Microphone with 1mm Detachable Cable and 3.5mm Connector from Countryman is an over-the-ear earset, similar to a classic E6 earset, but with a shorter boom designed to work with the Sennheiser Evolution wireless microphone system. It provides suitable isolation at the mouth, but with less visibility than an E6 Omni earset, and can be used to capture audio for general speaking and vocal applications. With an equalizing circuit built into the audio connector, the frequency response is tuned so you can experience full-bodied bass and precise highs that are warm and natural. The element, boom, and sub-miniature connector are all easily hidden on the user's face. The boom position near the ear helps to eliminate breath pops and vocal plosives on the mic. The 1mm detachable cable terminates to a 1/8" (3.5mm) locking connector for direct connection to a Sennheiser Evolution Series (G2 and G3), EW 100, EW 300, EW 500, or SK 1093 bodypack transmitter. Lower gain, for powerful vocals requiring the highest overload. Box Dimensions (LxWxH) 9.1 x 5.2 x 1.5"
E2 Unidirectional Earset Microphone with 1mm Detachable Cable and 3.5mm Connector (W6 Band, Cocoa) is rated 4.5 out of 5 by 2. Rated 4 out of 5 by Anonymous from would buy this product again This is used to capture audio that is televised & podcast.